Fall is in the air, the days are shorter and cooler, the summer heat is behind us and I still have tomatoes growing in the garden. This year was my first year to do a trial run of a garden and I’m happy to report I had moderate success with it and learned that grasshoppers are little insect heathens and were the demise of my cucumbers. I planted everything back in May. From seeds: tomatoes, cucumbers, and cilantro. From a plant: basil, oregano, and jalapenos. My mom informed me I’d planted the tomatoes too late in the season, that my aunt generally starts hers inside in February before transplanting outside in May, and so I probably wouldn’t get any. Boy, was she wrong! They flourished, for which I’m glad. Little cherry tomatoes that I’d pluck off the vines, rinse, halve and throw into our salads. The other day, after a nice five mile long walk in the park with the dog in which I enjoyed the vast colors of the leaves, I arrived home hungry, looked in the back and realized I’d better do something quick with the tomatoes. I’ve also recently learned that for the tomatoes that are still green, I can go ahead and remove them from the vine, place in a brown paper sack and if stored in a cool, dry place, they will eventually ripen. That sounds too good to be true, but I’ll try it! Boil the tortellini per package directions. I usually have a few packages I keep in the freezer, so the cooking time is always a bit longer. Once fully cooked, strain the water and rinse the tortellini thoroughly with cool water. 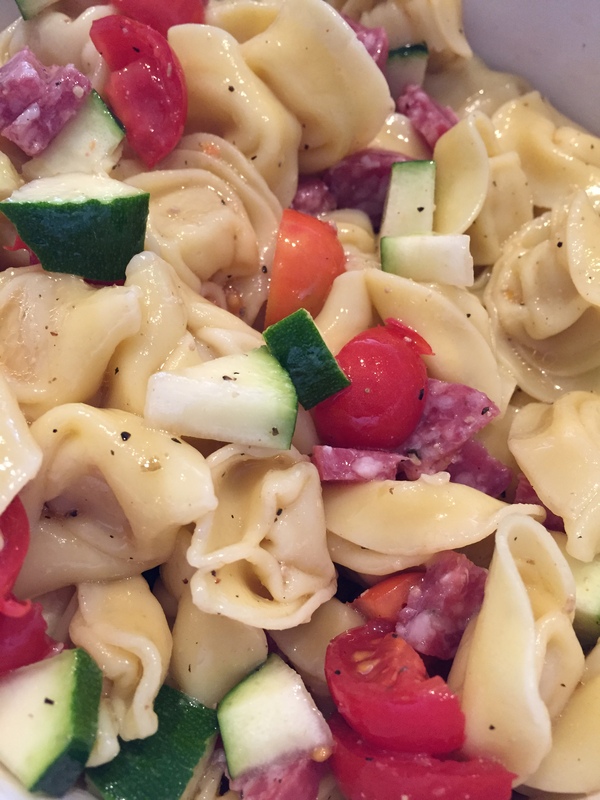 Shake off excess water and place tortellini in a medium sized bowl. Add in the cut up vegetables and chopped salami, pour in some Italian dressing and toss until coated. A light summertime, albeit fall lunch is served. This entry was posted in Italian, Salads. Bookmark the permalink.